This Document is not complete, the code works and is tested but documentation is far from complete. This page is intended as a list of example ideas for using the keyboard simulation in phatIO. 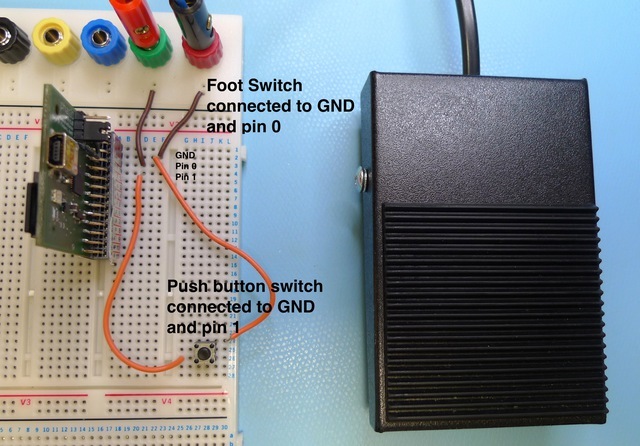 Push button switch connected to pin 1 and foot switch to pin 0 with other terminals to ground. I’ve just wired up two push button switches to pins 0 and 1, with the other terminal to ground. One is a micro switch fitted on the bread board, the other is a foot switch - useful for putting under the desk to use when working at your computer. The pins are set in HIGH mode - digital inputs pulled high (to 5V) via an internal resistor. The following ideas don’t necessarily have to be triggered from a switch - it could be an analog condition or some other event. Add the following code to run.lio or copy the version in the resources sidebar on the right of this page to your phatIO and uncomment the required action. See the keyboard section of the guide for how to simulate Control and Function keys. A sequence of gmail shortcuts can be added together to script and action. The shortcut has to be on the desktop or within the Start Menu (C:\Documents and Settings\%USER%\Start Menu). Check the Keyboard System Preferences panel for keyboard shortcuts available for your entire mac or specific applications - you can automate just about anything, the following zooms in when one button pressed and zooms out on the other.